1. Which caliber is better overall? .270 all day long. .308 Winchester ? Those are potent loads. 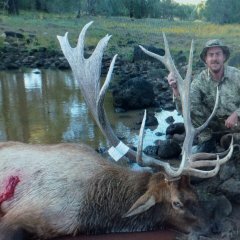 Would be great if you shared your recipe and rifle specifications with the forum members some of which might like to try them. I like the 308 Win because it is such an efficient cartridge. It works extremely well and brass is never a problem to find. It is also very accurate and barrel life is excellent. To get it to shoot with a trajectory similar to some 7RM factory loadings is a real bonus, and to do that with an all copper bullet is even better. One major advantage that 7mm rifles have one the 30 caliber rifles is that factory rifles have tighter twist rates, allowing the stabilization of longer bullets that have long ogives. This translates into higher BCs, but the major advantage that 30 cal rifles have is a larger bore diameter permitting greater bullet energy and speed. To get a 180 30 cal bullet to exceed 3000 fps is not hard, and can be done with the short mag and conventional powders and possibly the 30 06 case and Superformance powder. Slow twist rates have been responsible for the underperformance of some excellent cartridges. The most dramatic example is the 6mm Remington, a superior cartridge to the 243 Win, but the 243 became more popular because of the 1:10 twist that allowed stabilization of the 100 grain bullet. Likewise the 270 has been overlooked as a long range cartridge because the 1:10 twist barrels that dominate factory rifles are not able to stabilize long bullets. 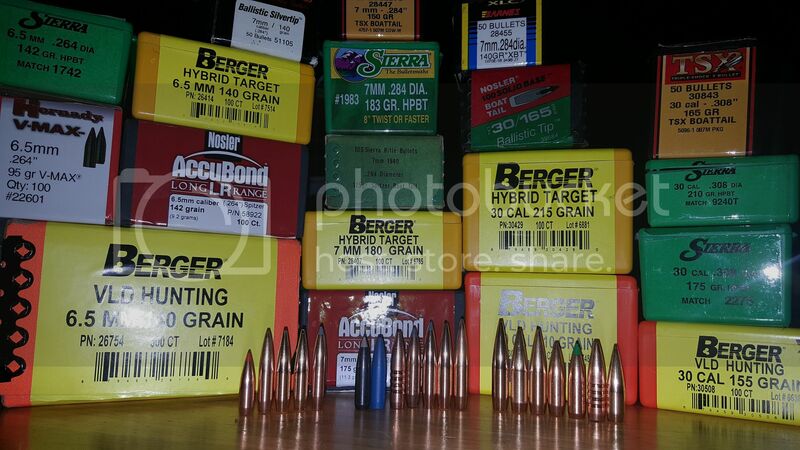 Berger makes a 170 gr bullet that requires a 1:8 twist but has a G1 BC of .665, so there are some shooters already realizing this a Berger is tapping into that market. Wonder what one could do with that bullet in a 270 Wby mag cartridge with a 1:10-1:8 gain twist 28" barrel. What the practical limit on twist rate is I do not know, but there has to be a point where the twist becomes so tight that it significantly increases friction and pressures limiting muzzle velocity. The trajectory you quoted for the 180 gr 7mm bullets is impressive. Maybe give us some more data on the set up. What were the atmospheric conditions, sight height, zero distance (200yds?) and the calculator used? I would like to plug in my data into the calculator you used under the same conditions and see how the trajectories compare. Also the bearing surface for the 150BD bullet is about 20-25% less than the 155gr Amax. This weekend I will see how it performs out of a short mag case. The reason I ask about the trajectory calculator and the atmospheric conditions is that plugging in the BC and MV you quoted for the .675BC bullet into the Shooters Trajectory Calculator I get 34.4 in drop at 500 and 231.58 in drop at 1000 yds under standard conditions assuming a sight height of 1.5 inches and a 200 yd zero sight in. My rifle. There is a thread on here with all of the build specs. Rem 700BDL LA, 26" Bartlein 1 in 8.5" twist #3 fluted. Scope mounting height is 1.82" over bore. 200 yard zero is about .2" high, and refelcted in my calculations. 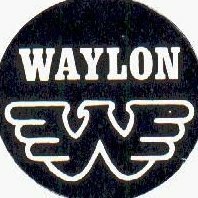 Atmospheric conditions: 28.22" baro, 70°F, 50% humidity, 0 wind. Spin drift utilized, powder is temp stable. I have confirmed my Shooter app is accurate to within 1" out to 680 yards with this load so far, as I just built the rifle about 2 months ago. I will be stretching it's legs in the near future to at least 1370 yards when I get a free weekend. Considering that all of my other rifles have been within 2" of elevation at 1000+ yards with accurate inputs, and I have verified this info to 680 already, I am pretty confident of the projected results at 1000. Not many of my calculations are general susumptions, they are field verified actual drops. Where I shoot to 2200, the conditions are 27.14"-26.90" baro dependent on weather fronts. Temps vary ny day of course. But 1770 is shot quite often during load testing and verification. Just haven't stretched my 7RM to that distance yet. But I will. At 682, calculated drop for 680 was 3.2MIL & 78.2" drop. Impact group center was 1.05" low for 3 shots with a group size of 2.8xx". Not my beat, but not terrible during load development either. I assume your last post describes the test on the rifle you built in memory of your father-in-law. That was a very touching gesture matched only by the quality and beauty of the rifle. Thanks for sharing. Looks like you have an ideal test facility. A calm day in SD is 10-15 and gusty. I should spend my time making wind turbines instead of bullet testing. For the sake of illustration the 150 BD bullet in my the post that compared it to the Hornady 7mag factory loads, plugging in your atmospheric conditions into the shooters trajectory calculator gives the following result for 500 and 1000yd drop and sight height 1.5"
MV 3150 150gr all copper HP tipped BC .480 (measured) 500yd = 33.4" &1000 yd = 242"
Clearly the 7mm 180 gr Berger is a superb bullet. We have used Berger as a benchmark to test the efficiency of our bullet designs. By reducing barrel friction and using a more efficient powder the performance of the 308Win is clearly increased. This bullet is stable out of a 1:10 barrel. Eventually we will see what can be done to the 180gr 30 cal bullet to function from a 1:8 twist. Above are some examples of the bullets we have been making and testing. 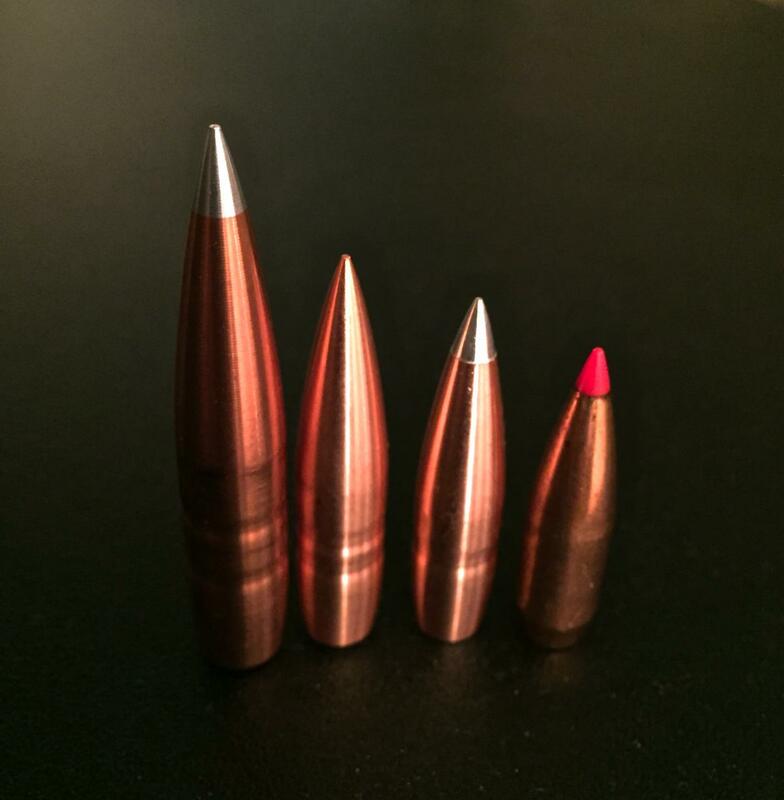 The 30 cal 150BD in question is just to the left of the 155 Amax (red tip far Rt). The 150BD has 20-25% less bearing surface than the Amax. The big one to the far Lt is a 260 gr 338 bullet and the one in between is a 180gr 30 cal solid. These are a few of the bullets I have tried, and some I am currently using. If you get a good 190+ gr. in .308" or 165+ gr. in 7mm, that would work on game, I would put them through their paces for you. Or if you want to send me a couple of the 150s, I will see how they do at 3500+fps... Considering I pushed a 175 SMK to 3380, I think I could get those up to 3500.
isnt the down range velocity and lbs of energy far greater with a 7mm? No. A .308 caliber bullet will retain more energy down range than a .284 caliber bullet. Compare a 210 vld in .308 vs a 180 gn vld both fired at 2900 fps and see what you come up with. Now if you are trying to compare a .308 win vs 7mm rem mag then yes the 7mag will win. Seems this thread started out comparing .308 vs .284 and turned into .308 win vs 7mm mag. oh i didnt even know what i was reading i guess lol. You offer is very generous. We have the 150,180 and 196 gr 308. From the looks of it you likely have a 30 cal magnum of some type, which would be perfect. My email is shrlandgeo@gmail.com. Shoot me an email with contact information and we can arrange to send you some.